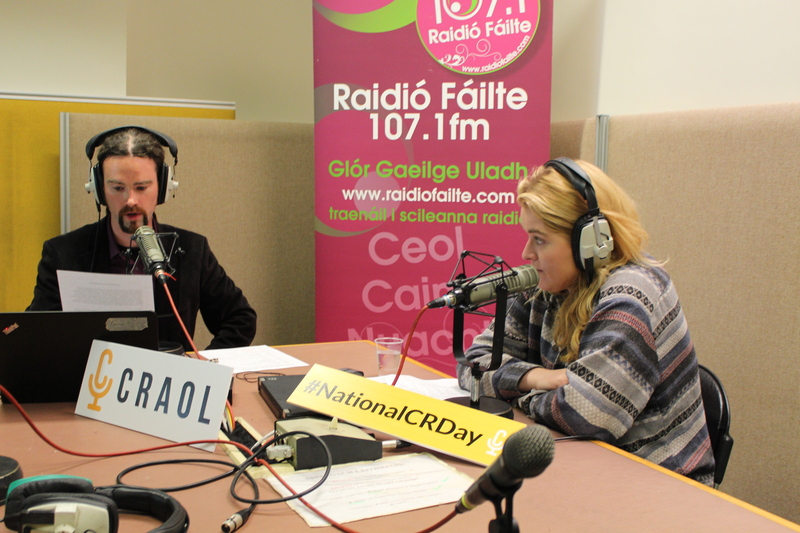 Raidió na Life will celebrate National Community Radio Day 2018 on this coming Friday, 22 June 2018 with an enhanced day-time schedule as well as competitions and live reports from across the country from other radio stations in the Craol community radio network. This is the fourth year of the celebration which highlights the work of community radio stations across the country. Raidió na Life will be to the fore on the day as it broadcasts from new radio studios on Amiens Street for the event. The day’s events will kick off early with a special two hour edition of the breakfast show, An Bricfeasta Blasta with Niamh Ní Shúilleabháin and Niamh Ní Chadhla from 08:00-10:00. Expect special guests, interview with broadcasters and stories from those involved in the community sector in Dublin as well as the usual morning banter and music. Other shows to be broadcast include a special magazine show, Beo ón ardchathair with Cóilín Ó Dubhthaigh (12:00-13:00) and a special edition of An Seinnliosta presented by Ola Majekodunmi. Aindriú Mac an Rí will also return for a special edition of An Meangadh Beag with an emphasis on Irish language bands and music performed through the medium of Irish. Local businesses have been keen to support the day and a range of competitions will run across the day including a voucher for the restaurant Bunsen, tickets for the upcoming BluesFest festival and a chance to go ziplining in the Dublin mountains with Zipit! Throughout the day, special inserts will feature insights and a history of community radio broadcasting on a global level. Raidió na Life is a proud member of Craol, the umbrella body for the Community Radio sector in Ireland. Every week over 2000 volunteers broadcast with stations across Ireland. This year will see the launch of a new campaign to promote awareness of community radio. There are 20 licenced stations and 30 aspirant stations registered with Craol. Raidió na Life has provided an Irish Language community radio service to the Greater Dublin Area on an educational and community basis since 1993. The station receives financial support through grant assistance from Foras na Gaeilge through its Scéim Raidió Pobail 2016-2018. The station has a small staff of three full-time employees, and two part-time staff. Between 100 – 150 volunteers take part in the running of Raidió na Life every week. The station’s Board of Management also works on a voluntary basis. Thousands of presenters have gained valuable broadcasting experience in Raidió na Life over the course of the past 25 years, including renowned broadcasters Sharon Ní Bheoláin (RTÉ News), Sinéad Crowley (RTÉ News), Dr. Aoibhinn Ní Shúilleabháin, Cormac Ó hEadhra (‘Cormac ag a 5’ RTÉ RnaG, ‘The Late Debate’ RTÉ Radio 1), Aedín Gormley (RTÉ Lyric FM), Colm Ó Mongáin, Rónán Ó Muirthile (Presenter ‘Splanc’, Newstalk), Cearbhall Ó Síocháin (RnaG), Fachtna Ó Drisceoil (RTÉ/RnaG), Barbara Nic Dhonnachadha (Classic Hits 4FM), Darragh Ó Tuama (Newstalk) and many more besides. The station is recognised for the high-quality talk programming which it produces for a wide range of age groups and interests within the Irish Language community in Dublin. It is also known for its eclectic music mix. Raidió na Life first came on air full-time on 25th September 1993 and the station celebrates 25 years on air in Bliain na Gaeilge 2018.